Polyurethanes are an incredible product that mimics the traits of both plastic and rubber to create something that is uniquely useful. Polyurethane, very generically speaking, is a mixture of two (or more) liquid chemicals, a prepolymer and a curative, that when combined at the proper ratio and temperatures produce a chemical reaction resulting in a solid finished product. We use urethane for several applications as it’s awesome at abrasion control and impact resistance. This product is so special, here are five things we bet you didn’t know about it. Numerous additives can be introduced to polyurethane to change its appearance and characteristics. Additives can be as simple as pigment added to change its color and as complex as graphite, fiberglass, Kevlar, ceramic chips, etc. to improve various characteristics. One of the most common variants in polyurethane is its durometer or hardness. Polyurethane can be cast as soft as a 20 Shore A (like a rubber band) up to a 90 Shore D (for example nylon or a military combat helmet). This is one of the first things a manufacturer will ask for when replacing a polyurethane part. Urethane can be produced in different forms including elastomers and coatings. This means we can spray it or use it as a sheet product. This adaptability makes urethane the perfect product to use for custom jobs. For example, spray urethane can be applied to almost any substrate including steel, aluminum, stainless steel, concrete, wood and fiberglass, making its applications endless. Urethane does much better in the cold than rubber. When the temperature drops, rubber may break down, but urethane keeps doing its things. If you have a piece of equipment that needs abrasion or corrosion resistance – and it will be exposed to the elements – you may want to consider covering it with urethane. 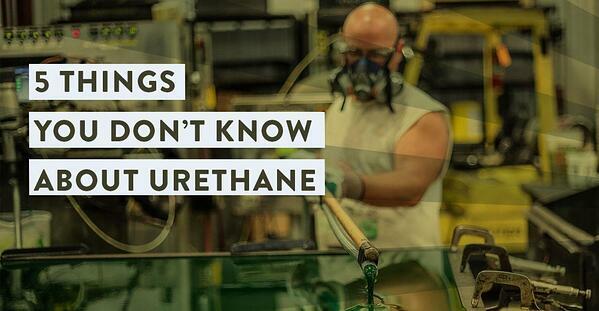 Some of our favorite products are made from urethane. The HawkPad and Tuff Tube® are both made from highly-durable urethane. Our HawkPad® features a unique bonding of multi-layered hardwood to a custom blended urethane which allows it to last three times longer than traditional gum rubber press pads. The Tuff-Tube® lining system is a patented urethane spout liner which reduces the abrasion of grain, seed and fertilizer handling, extending the life of your equipment. Both are made with our proprietary Endurawear urethane. Are you interested in seeing what this amazing product can do for your business? The applications are endless. Contact us today and we’ll tell you exactly how you can implement its many uses to save time and money.